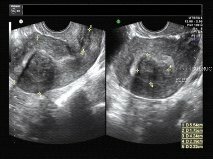 Fibroids are masses that occur commonly in the uterus. They are made of uterine muscle, and grow into the normal muscle layers of the uterus. They undergo fibrosis with time; hence their name fibroids i.e. like fibrous tissue. They vary in size from very tiny to large masses, and are almost always benign. Most cause no problems, and do not need to be removed or scanned again. Scan can be performed with full bladder from the tummy. Thickness of the lining of the womb.